The September 11 attacks (also called 9/11),[nb 1] were four terrorist attacks against the United States. They all happened on the morning of Tuesday, September 11, 2001. The attacks killed 2,996 people, including the 19 attackers, making it the deadliest terroist attack in history. They caused more than $10 billion in damage to infrastructure. They were carried out by the Islamic terrorist group al-Qaeda. They used passenger airplanes to destroy famous buildings by flying the planes into them. There were two attacks in New York City and one in Arlington, Virginia. The fourth attack did not work and the plane crashed in a field near Shanksville, Pennsylvania. From top to bottom: the original World Trade Center's twin towersburning; a section of The Pentagon collapses; Flight 175 crashes into 2 WTC; a fireman requests help at Ground Zero; an engine from Flight 93 is recovered; Flight 77 crashes into the Pentagon. Location New York, New York; Arlington County, Virginia; and near Shanksville, Pennsylvania. 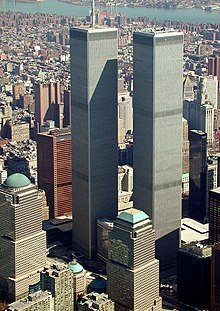 The buildings attacked were the World Trade Center's twin towers in New York City, and the Pentagon in Arlington, Virginia. The fourth plane crashed in an empty field in Pennsylvania before it could reach its target in Washington, D.C. That target was either the White House or the United States Capitol. After the event, the United States government said the people who had done the attacks were close to the terrorist group al-Qaeda. The World Trade Center in March 2001, which was destroyed by the attacks. The first of the four planes to take off was American Airlines Flight 11, a Boeing 767-200ER. It was 159 feet (48 m) long and 16 feet (4.9 m) wide. It had two aisles. The plane made daily flights between Boston and Los Angeles. When it took off at 7:59 a.m. on the morning of the eleventh, it carried only 81 passengers in its 158 seats. Forty-seven minutes later, it crashed into the North Tower at 440 miles per hour (710 km/h). It was carrying 9,717 gallons of jet fuel, 14,000 fewer than it was able to carry. United Airlines Flight 175, also a Boeing 767-200ER, was the second. Like American Airlines 11, it was scheduled to fly from Boston to Los Angeles. When United 175 took off at 8:14 a.m., it was even lighter than the American flight: Only 56 of 168 seats were filled. When it crashed into the South Tower of the World Trade Center at 9:03 a.m., traveling 540 miles per hour (870 km/h), it had 9,118 gallons of fuel in its tanks. 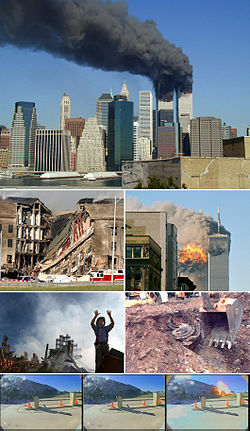 This crash was broadcast live on many television channels worldwide that were already showing the North Tower burning. The Pentagon in 1998, which was damaged after American Airlines Flight 77 crashed into it. American Airlines Flight 77 was the third plane to take off. It was a Boeing 757-200. It left Washington, D.C. at 8:20 a.m. going to Los Angeles. It was two-thirds empty, with 58 passengers in its 176 seats. It was carrying 4,000 gallons of fuel, less than the 11,500 gallons it could carry. It crashed into the Pentagon at 9:37 a.m., ­flying at 530 miles per hour (850 km/h). Either the White House (top) or the United States Capitol (bottom) were the targets in Washington, D.C. of the failed United 93 attack. The fourth plane, United Airlines Flight 93, was also a 757-200. It was traveling from Newark, New Jersey to San Francisco. It was scheduled to leave at 8 a.m., but was delayed for 42 minutes. When it finally took off, it carried only 37 ­passengers in its was 182 seats. It had a little over 7,000 gallons of fuel. At 10:03 a.m, it crashed at 560 miles per hour (900 km/h) into an empty field near Shanksville, Pennsylvania. All of the 246 people on the four planes died in the crashes. 19 terrorists were also killed in the attacks. Both towers of the World Trade Center caught on fire after the crashes. The South Tower (2 WTC) burned for 56 minutes before it fell and was destroyed. The North Tower (1 WTC) burned for 102 minutes before it also fell. As the towers fell, parts of the towers hit other buildings around them. It is believed that because of this damage, a third building, 7 World Trade Center (7 WTC), fell at 5:20 p.m.. Many other buildings in the area were damaged badly and had to be demolished later, leaving the whole World Trade Center complex destroyed. 2,602 people died at the World Trade Center. The plane that hit the Pentagon hit the ground just as it hit the western side of the building. It then crashed through three of the five "rings" that make up the Pentagon. The crash killed 125 people in the Pentagon. The United States government paid an average of $1.8 million to the families of the victims of the attacks. There were 2,996 people who died in the attacks. They included firefighters and police officers trying to save the other people. They also included the 19 attackers who were all killed. The attacks also led to the United States Department of Homeland Security being created, which protects the country from terrorist attacks. Many conspiracy theories have appeared which say that certain people in the United States government knew about the attacks, or even made them happen. These have been said to be false by the government. The War on Terror also led to real wars. The leader of Al-Qaeda, Osama bin Laden, lived in the Islamic Emirate of Afghanistan. The United States told the government of Afghanistan, called the Taliban, to turn bin Laden over to them. The Taliban would not do this. The leader of the Taliban, Mullah Muhammad Omar, demanded to see proof from the United States government. If proof was not given, Mullah Omar said that he would not hand over bin Laden. President George W. Bush said that he did not need to provide proof. The United States then went to war against Afghanistan. The Taliban was removed from power, a new government was put in power, and a new president was chosen by the people of Afghanistan. While this was happening, the United States government changed in a few ways. The United States Department of Transportation (DOT) created the Transportation Security Administration (TSA). Before 9/11, security at American airports was provided by the airlines. The TSA made it the government's job to provide airport security. New officers were hired by TSA to work at airports and to fly on planes as air marshals. The TSA also provides security on American trains and subways. A new Department of Homeland Security was also created. It became their job to protect Americans and their property inside the United States. When this department was created, the TSA moved from the DOT to Homeland Security. After defeating the Taliban, President George W. Bush thought the US should invade Iraq. He believed that Iraq helped terrorist groups, including al-Qaeda. He said he had evidence that Iraq was also making weapons of mass destruction. He sent Secretary of State Colin Powell to the United Nations to show them some of the evidence. In March, 2003, the United States began its invasion of Iraq. (Four other countries also took part, including the United Kingdom, Australia, Poland, and Denmark.) The government of Iraq was overthrown, and the people of Iraq elected a new government. No weapons of mass destruction were found in Iraq. Wikimedia Commons has media related to September 11 attacks. 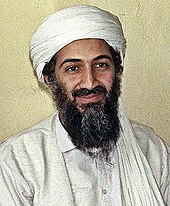 On May 2, 2011, United States Navy SEALs killed al-Qaeda leader Osama bin Laden, who led the September 11, 2001 attacks, among other terrorist attempts. ↑ 9/11 is pronounced "nine eleven". The slash is not part of the pronunciation. The name is used worldwide, although the dating conventions differ in some countries. ↑ "Bin Laden claims responsibility for 9/11". CBC News. October 29, 2004. Retrieved 2011-09-01. Al-Qaeda leader Osama bin Laden appeared in a new message aired on an Arabic TV station Friday night, for the first time claiming direct responsibility for the 2001 attacks against the United States. ↑ "Winnipegger heads to NY for 9/11 memorial". CBC News. September 9, 2011. Retrieved November 13, 2013. A total of 2,996 people died: 19 hijackers and 2,977 victims. ↑ "Worst terrorist attacks in world history". World Atlas. Retrieved March 22, 2019. ↑ "How much did the September 11 terrorist attack cost America?". 2004. Institute for the Analysis of Global Security. Retrieved April 30, 2014. ↑ Matthew J. Morgan (August 4, 2009). The Impact of 9/11 on Politics and War: The Day that Changed Everything?. Palgrave Macmillan. p. 222. ISBN 978-0-230-60763-7. ↑ Moghadam, Assaf (2008). The Globalization of Martyrdom: Al Qaeda, Salafi Jihad, and the Diffusion of Suicide Attacks. Johns Hopkins University. p. 48. ISBN 978-0-8018-9055-0. ↑ Livesey, Bruce (January 25, 2005). "Special Reports – The Salafist Movement: Al Qaeda's New Front". PBS Frontline. WGBH educational foundation. Retrieved October 18, 2011. Geltzer, Joshua A. (2011). US Counter-Terrorism Strategy and al-Qaeda: Signalling and the Terrorist World-View (Reprint ed.). Routledge. p. 83. ISBN 978-0415664523. ↑ "The Attack Looms". 9/11 Commission Report. National Commission on Terrorist Attacks Upon the United States. 2004. Retrieved September 1, 2011. ↑ Boxer, Sarah (September 11, 2002). "One Camera, Then Thousands, Indelibly Etching a Day of Loss". The New York Times. Retrieved November 17, 2008. September 11th Photo Gallery - Also includes victim names and more information.